As we all know that world is progressing speedily in the field of technology as well as in inventing new things to ease mankind. So, with that rapid increase in the progress, a new era has been started of manufacturing the high quality workout training equipment especially for the people who want to work out indoor. This indoor machine is the bestselling rower all around the world with its antique design and quality. This Model 2 offers us a great cardiovascular relaxation that will surely increase the level of our fitness as well as it makes our bones more strong. The Model D rower has been structured in such a way that it makes easy for everyone to operate it. The level of its quality can be analyzed by looking at the mechanically engineered parts which do not corrode with the time. It is somehow the same machine which is used for the athletes in the Olympics to analyze their results after exercise. Similarly, Concept 2 Model D gives you the same opportunity to check out your calories, distance, speed and pace at which you have done the work out. In short, it provides you a complete check on your body to enhance the level of your fitness. It also indicates you that how much calories have been burnt by you during the training on this specially designed rower. There is a display screen at the back of this machine which shows you all this info with great accuracy. This is not all! Model D provides you the access of the menu on the screen from which you can change the language and you can look at the complete analysis of your workout. Moreover, it allows you to play different games on the device which are totally based on the theme of training and exercise effectively. Other features are also displayed on the screen such as to preset the workout details or the timer, etc. another very major feature of this rower is that it can store or even transfer your work out details or record to your MAC or PC directly with the help of a USB flash drive. This is one of its greatest advantage that it can keep up the record of your work out which can be later analyzed. What else you can find in a rower! But it does not end here as it contains the facility of attaching heart monitoring devices by connecting it through Bluetooth or an antenna is provided for the wireless devices. This wireless facility of PM5 Model D allows you to connect with computers and smartphones to see the details right at that very moment. All other accessories are included with its new purchase and that includes USB flash drive, chain oil, performance monitor and a user guide is also available to make sure that the customer uses it properly. Some other attachable tools are also included in the Model D set. 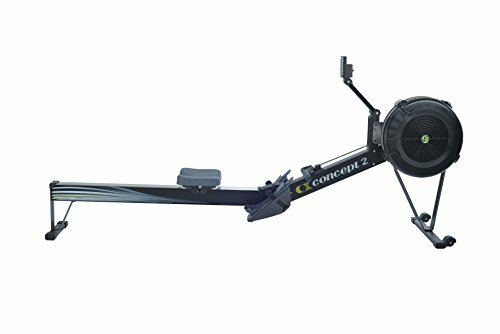 This model D rower comes under the warranty of 5 years which makes it quite sure that it will remain effective for a long period of time. However, the PM5 monitor and other moving parts have 2 year warranty. It is very light weight (57 pounds). You just need to but a battery for its proper functioning. Model D gives you all the benefits a rower can offer and it comes as a complete package to ensure that your fitness has a proper check and balance system. Don’t think twice when buying Model D PM5 rower.